A Vital Ministry describes the situation of the 'post-millennium' generation of the young as threatening to their human flourishing. Their economic, political and cultural context is potentially oppressive, and the education system in this country no longer seeks to provide 'spiritual capital' to resource the young. The special role of Church of England schools is to provide a holistic education which values the spiritual dimension, genuinely encouraging the personal and spiritual development of young people as 'children of God'. Drawing on the testimony both of school chaplains and school students, the book argues that the chaplain's ministry of pastoral care has a key part to play in the fostering of personal spiritual development, and that the role of the chaplain as a liturgical leader can open up the spiritual realm for students. The Church needs to take seriously this vital but neglected ministry, the book concludes, arguing for better recognition, professional support and development. The literature around chaplaincy as a mode of ministry and mission is expanding rapidly. Each sector has distinctive challenges and opportunities, and John Caperon offers an enormously helpful insight into the work and impact of school chaplains. What comes across acutely is the clarity with which school students perceive exactly what the chaplain is for, and the appreciation they often demonstrate. Caperon shows how much the Church gains from chaplaincy. How and why chaplains need the Church may be a topic for another study! Here is a plea - passionate, pragmatic and theologically literate - for the Church to take seriously the ministry of school chaplaincy. 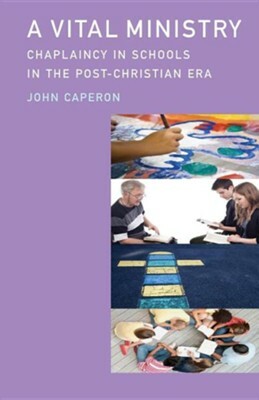 Drawing on 'real world research' with chaplains and importantly also with students, the author roots his discussion in an understanding of the Church's mission and the 'ministry of presence', asserting the central importance of pastoral care in a world where targets and instrumentalist notions of mission threaten to dominate. A vital book indeed! I'm the author/artist and I want to review A Vital Ministry.